The Riviera Hotel was opened in 1955, within one month of the openings of the Dunes and Royal Nevada. The Miami inspired architecture changed the desert skyline and set it apart from the other hotels on the strip. 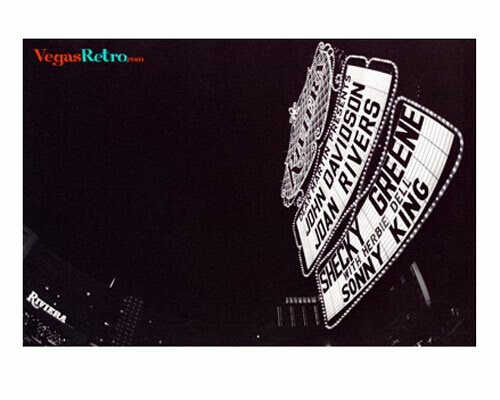 The Riviera was also instrumental in setting Las Vegas apart from all other entertainment venues around the country, when it brought in showman Liberace and paid him an unprecedented $50,000 a week. Liberace had received $5,000 a week at the Adolphus in Dallas just before his Riviera debut. From that point on Las Vegas would have the "creme de la creme" of entertainers on their stages and clubs in New York, LA and Chicago, without gambling to pay the bills, were unable to match the extravagant paychecks of "the entertainment capital".